KTM’s mind-bending 1290 Super Duke R ended up winning MO’s Motorcycle of the Year in 2014 for its raw power and versatility. If you are not familiar with this model, imagine being strapped to a bar stool and then being pulled behind a speeding commuter train. 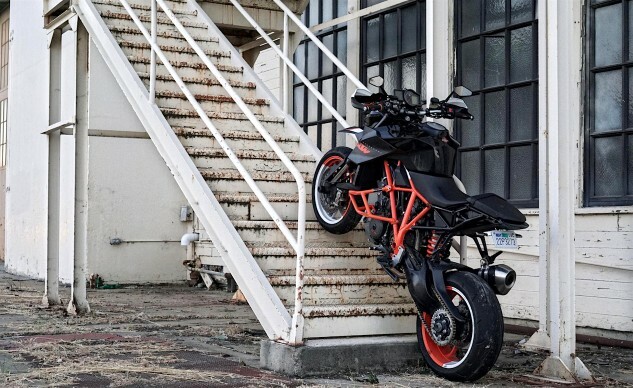 Where some manufacturers talk about putting a superbike on the street, KTM really does it, except with high bars and no wind protection, because… well, because I’m not sure why. A personal theory is that Austria is what happens when Germans drink too much. But thank God they did it because the world is always short of expensive, loud and beautiful things. Two men who I’m pretty sure agree with me are Messrs. Conan Dooley and Denis Ivanov. It all started when AMA/AFM racer Erik “GoGo” Gulbranson campaigned a Super Duke 1290 R in 2015 and then had his friend Dooley convert it to street trim so he could sell it. 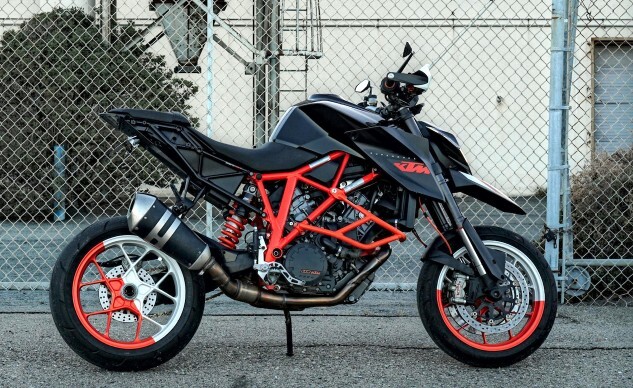 Dooley’s other pal, Denis, offered to buy it – if Conan would build the Super Duke into the all-around supermoto superbike KTM should have built in the first place. As Conan writes in his build thread, he’d been thinking about doing this for a long time. One of his favorite bikes is the KTM 990 SM-T, which is the old 990 SM with some touring amenities baked into it. “There’s something about massive suspension travel paired with big power that makes for an awesome urban warfare vehicle,” writes Conan. The design brief was straightforward: increase suspension travel and ground clearance to turn the sporty 1290 Super Duke R into a 150-hp supermoto with the latest in electronic safety and rider aids. It should also look like a factory-built bike: the one KTM should have built in the first place. Oh, and stairs. It should be able to climb stairs. I forgot to ask why. Sounds complicated, but not for 31-year-old Dooley, who started riding about 12 years ago (in fact, I met him at his first track day at Buttonwillow Raceway near Bakersfield, California, while testing bikes for this story, again, totally randomly). You may have trodden his same path – he liked riding but didn’t have enough cash to pay somebody else to fix his bike. If he wanted to ride, he had to learn how to wrench. His friends helped him learn, and as his skills progressed, he learned about machining parts, chassis geometry, suspension design and all the other things you need to know to ride the bike you want. You should be able to climb stairs with your motorcycle. 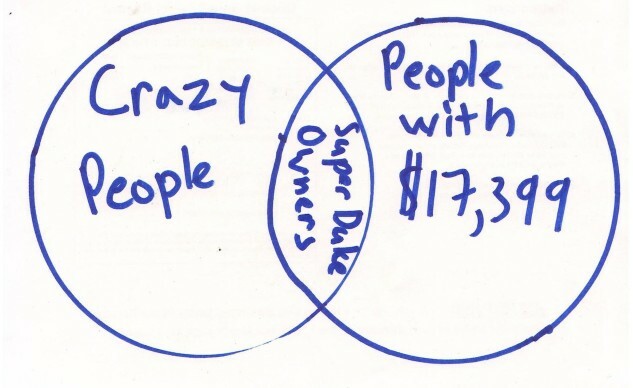 This makes sense if you have bad knees. 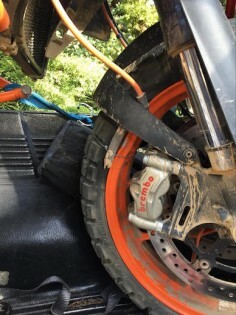 Ninety-five percent of the new parts are KTM, with one Harley-Davidson part, a 61mm fork brace that was just right for bolting on the beaky front fender. Other mods included an 1190 Adventure exhaust, Continental TKC 80 dual-sport tires, and handguards. All in, he says it’s about 20 pounds lighter than the Super Duke R’s 471-pound wet weight, with 8.5 inches of suspension travel and the polished, clean lines of a factory machine. Some of you despise beaks but look at how nicely it matches the lines of the tank and radiator shrouds. Yes, this bit of wood and a bunch of plugs kept air in the Duke’s tire for the remainder of the Sheetiron rally. And the ride was epic fun. Surprisingly, Ivanov only crashed once –a low-speed tip-over – but he did have a few flat tires. Watch the video to see him repairing the dented front rim with a rock. The other flat had to be repaired with a handmade wooden wedge and some plugs, but the big Duke handled 285 miles of dirt, mud and other horrors with aplomb. Hats off to Conan and Ivanov for building something fast, fun and slightly crazy… and then riding it in a way not even an Austrian would consider. 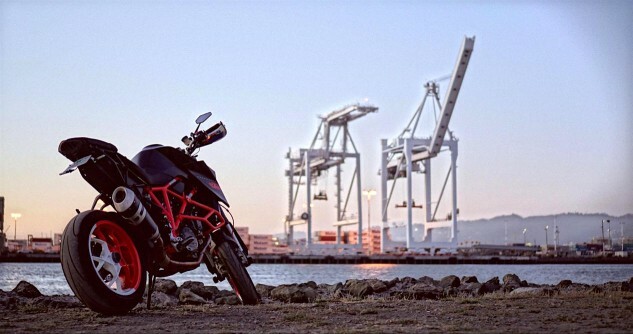 Thanks to KTM’s Ducati-like parts-bin engineering and some homegrown craftiness, Ivanov has the bike he wants. Gabe Ets-Hokin is an American businessman, television personality, author, and politician. He is chairman of The Gabe Organization, which is the principal holding company for his real estate ventures and other business interests. He believes it should be illegal to wear pants.